Kat and Karl : multi tasking... it's what we do. multi tasking... it's what we do. 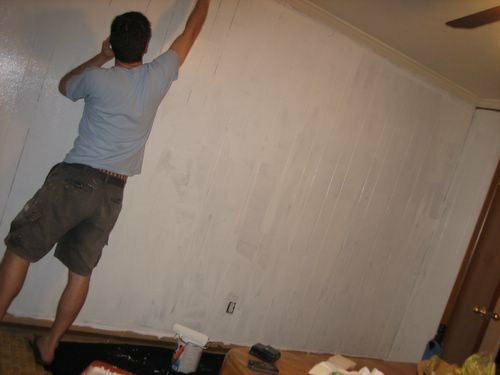 karl painting and talking on the phone... i will admit i felt a slight bit of guilt sanding and painting over the wood panel. it's pretty ugly (the paneling) but the painting is not really something easily undone. not sure when wood paneling will ever come back "in" but, hey, you never know! don't feel bad for painting over it. i would have too. I'm glad you painted over it and didn't tear it down. Good job. Ok - so I'm on a blog :) I feel your pain. We took our paneling down and it is a HUGE mess. We have paneling to and we need to paint over ours to it makes the room look so dark.